[Andreas Spiess] picked up a few inexpensive radar sensors. He decided to compare the devices and test them and–lucky for us–he collected his results in a video you can see below. How much current do they draw? How long to they show a detection? How far away can they detect the motion of a typical adult? What is the angle of detection? Can they see through certain materials? Can the devices coexist with other devices in the same area? What about WiFi networks? Good list of questions, and if you want to know the answers, you should watch the video. Ever wonder what’s inside a surface-mount inductor? Wonder no more as you watch this SMT inductor teardown video. “Teardown” isn’t really accurate here, at least by the standard of [electronupdate]’s other component teardowns, like his looks inside LED light bulbs and das blinkenlights. “Rubdown” is more like it here, because what starts out as a rather solid looking SMT component needs to be ground down bit by bit to reveal the inner ferrite and copper goodness. [electronupdate] embedded the R30 SMT inductor in epoxy and hand lapped the whole thing until the windings were visible. Of course, just peeking inside is never enough, so he set upon an analysis of the inductor’s innards. Using a little careful macro photography and some simple image analysis, he verified the component’s data sheet claims; as an aside, is anyone else surprised that a tiny SMT component can handle 30 amps? Looking for more practical applications for decapping components? How about iPhone brain surgery? [Madox] is a trackball user, which is fine; we at Hackaday respect and appreciate those who live alternative lifestyles. As you would expect, there aren’t many makes and models of trackballs being sold, and [Madox] wanted something ergonomic. A DIY solution was necessary, but how to you model something ‘ergonomic’ before printing it out? Floam, apparently. Floam is a sticky, moldable goo originally sold as the follow-up to Nickelodeon’s Gak in the early 1990s. 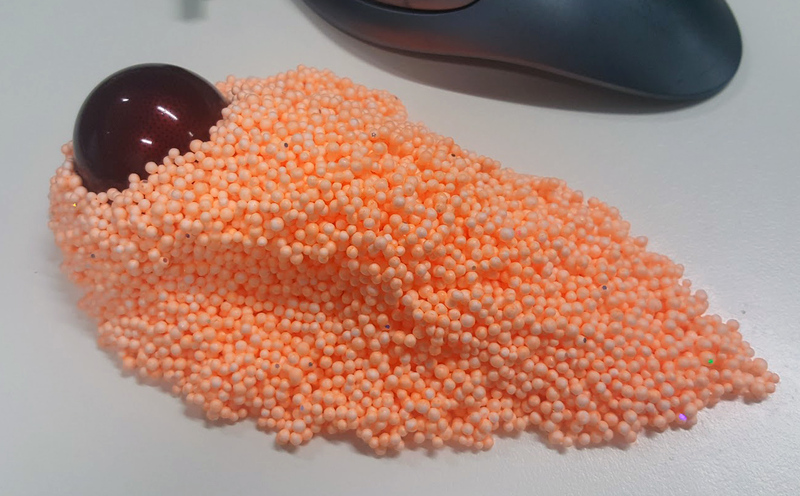 It consists of styrofoam pellets held together with a colored binder that doesn’t leave a mess and doesn’t dry out. While the Nickelodeon version is lost to the sands of time, a Floam-like substance is available at any toy store. [Madox] picked up a few blister packs and began modeling his ideal trackball. With the proper shape in hand, [Madox] needed a way to get this design into a computer. Photogrammetry is the solution, and while earlier experiments with Autodesk Catch were successful, Autodesk has morphed and rebranded their photogrammetry software into Autodesk ReMake. Turing a pile of styrofoam balls into a 3D model is as simple as taking a bunch of pictures and uploaded to Autodesk’s ‘cloud’ service. In just a few minutes, a proper 3D mesh arrived from the Autodesk mothership, and [Madox] took to importing this model into Fusion 360, fiddling with chamfers, and eventually got to the point where a 3D printer was necessary. It took a few revisions, but now [Madox] has a custom designed trackball that was perfectly ergonomic. We have a love-hate relationship with biometric ID. After all, it looks so cool when the hero in a sci-fi movie enters the restricted-access area after having his hand and iris scanned. But that’s about the best you can say about biometric security. It’s conceptually flawed in a bunch of ways, and nearly every implementation we’ve seen gets broken sooner or later. Case in point: prolific anti-biometry hacker [starbug] and a group of friends at the Berlin CCC are able to authenticate to the “Samsung Pay” payment system through the iris scanner. The video, embedded below, shows you how: take a picture of the target’s eye, print it out, and hold it up to the phone. That was hard! Sarcasm aside, the iris sensor uses IR to recognize patterns in your eye, so [starbug] and Co. had to use a camera with night vision mode. A contact lens placed over the photo completes the illusion — we’re guessing it gets the reflections from room lighting right. No etching fingerprint patterns into copper, no conductive gel — just a printout and a contact lens. [Alex Williams] created his Open Source Underwater Glider project as an entry to The Hackaday Prize, and now it’s one of our twenty finalists. This sweet drone uses motor-actuated syringes to serve as a ballast tank, which helps the glider move forward without the use of traditional propellers. Unlike most UAVs, which use motors to actively move the craft around, [Alex]’s glider uses the syringes to change the buoyancy of the craft, and it simply glides around on its wings. When the craft starts getting too deep, the syringes push out the water and the glider rises toward the surface until it’s ready for another glide. This low-power solution allows for long-term science projects and research. In addition to conserving power, the glider’s slow travel does not disturb the water or sea life. [Alex]’s goal is to make his glider open source and 3D printable, combined with off-the-shelf hardware and ArduSub under the hood. Saturday night marked the fourth annual Hackaday BAMF meetup. The night when weary exhibitors close up their booths at Bay Area Maker Faire and head over to O’Neil’s Irish Pub where the real fun starts. There are many drawbacks to having a booth; you’re on your feet all day repeating the same small snippet to everyone passing by, and usually you don’t get much of a chance to mingle with friends old and new. Walking into the meetup, it was striking to watch aching bodies slow with weariness perk up to the energy and excitement of the Hackaday Community incarnate. Join me after the break for a peek into the fun of the evening. If you happened to look up during a drive down a suburban street in the US anytime during the 60s or 70s, you’ll no doubt have noticed a forest of TV antennas. When over-the-air TV was the only option, people went to great lengths to haul in signals, with antennas of sometimes massive proportions flying over rooftops. Outdoor antennas all but disappeared over the last third of the 20th century as cable providers became dominant, cast to the curb as unsightly relics of a sad and bygone era of limited choices and poor reception. But now cheapskates cable-cutters like yours truly are starting to regrow that once-thick forest, this time lofting antennas to receive digital programming over the air. Many of the new antennas make outrageous claims about performance or tout that they’re designed specifically for HDTV. It’s all marketing nonsense, of course, because then as now, almost every TV antenna is just some form of the classic Yagi design. The physics of this antenna are fascinating, as is the story of how the antenna was invented.